It's roughly a quarter of the way through the game's timespan, so let's look at how things shaped up since the starting date. Military setbacks cost us a great deal of our overall score and knocked us down in ranking for a few years, but we've made a recovery and still manage hold the status of a Secondary Power. Our treasury is not growing at a spectacular rate, but it is growing nonetheless and we have the beginnings of our industrial economy in place just waiting for workers to make use of it. Brazil's literacy has grown extremely well, up to over 28% from 7.7% 24 years ago. Our focus on educational technologies and constant full funding of education is an investment which is paying off. Daily research points have grown by nearly triple since we've started, so new technologies will only be coming more quickly. Our population has increased by nearly 20% and continues to grow, thanks in part to medical technology and immigration. 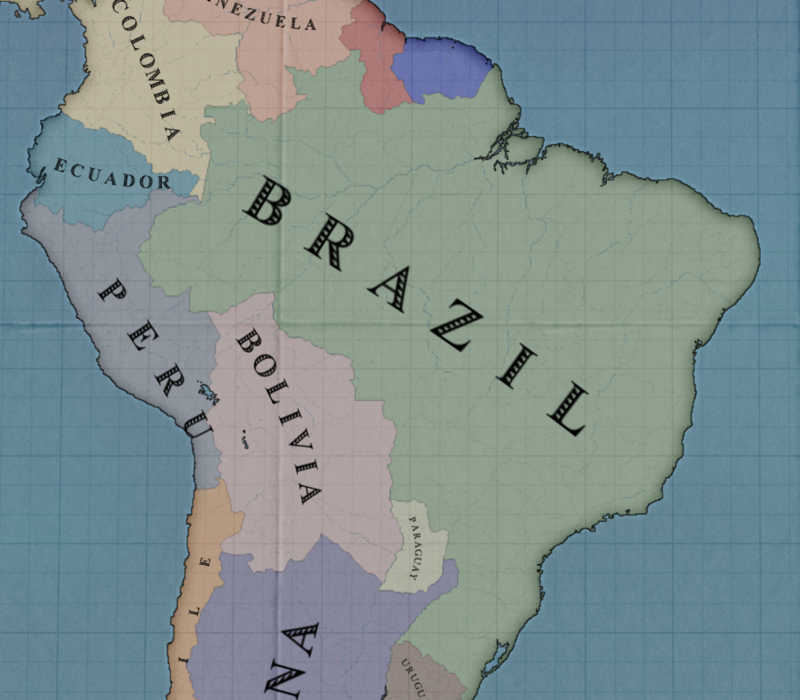 Brazil's new-found position as a sphereling of The United Kingdom has limited our revenue to some extent, forcing us to cut spending levels in administration and the military. Even with these cuts though, our population is fulfilling its own needs to a greater degree than it has ever been able to before. None of our population is going with their basic life needs unfulfilled or partially fulfilled. Nearly 20% of our population was enslaved at the start date, and now that population has been added into the farmer and laborer population of our country. With the times being as good as they are for our pops, there should be more social mobility as well, with our population changing to other types of pops more easily as the need for them arises. We maintain a simple baseline of technologies in army technology. Between standing armies and mobilization we should still be able to protect ourselves from our neighbors, but it may be worth investing into further research here if for no other reason than a better sense of security. Brazil's naval research has seen no attention whatsoever. It is completely out of date, and we would likely be unable to compete with anyone else who can actually field a navy of any size. At the bare minimum, we should aim to fill out the first row of techs and then take the steamers tech in the Construction column in order to build steam transports and steam powered screening vessels at some point. Business Regulations would be a good first target next time we revisit commerce techs. That would provide a further bonus to farming and mining efficiency, and it's the last tech in that column which provides such a bonus. The Economic Thought column and Organization column would both be good investments to make our factories more efficient, and the Financial Institution column would raise our tax collection efficiency, giving us more revenue for state projects at the cost of our pops not having as much to spend on their individual needs. The culture tab is clearly where we shine. We've researched as far in Aesthetics as the game will allow for this date. We are days away from researching Functionalism in the Social Thought column, granting further bonuses to education efficiency. Empiricism has just become available to research as the beginning of the 1860s, and I plan to aim for that next. It provides a further bonus to research points, and it has attached inventions which can grant us more prestige - something that I'm focusing on for us at the moment. Industry is clearly another area which we've paid some attention to. Steam Turbines would be a fine technology to research once we turn our attention back here. Further advancements in railroads are a sure fire way to improve our nation in a variety of ways, but we'll need to be sure that we have the money to start another batch of country-wide railroad projects before getting it. The ideologies of our population have shifted towards liberalism compared to the start date. 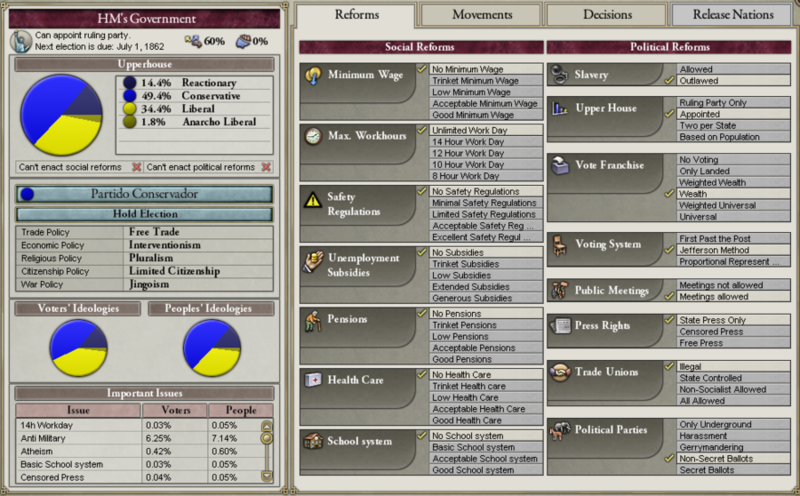 Since I'd like our nation to eventually have such things as universal suffrage social programs, this is a good direction to head in. Liberals aren't crazy for passing social reforms directly, but there are political reforms which will lead to the desire for social reform. From the ledger, this is the first page of nations ranked in order of Total Score. 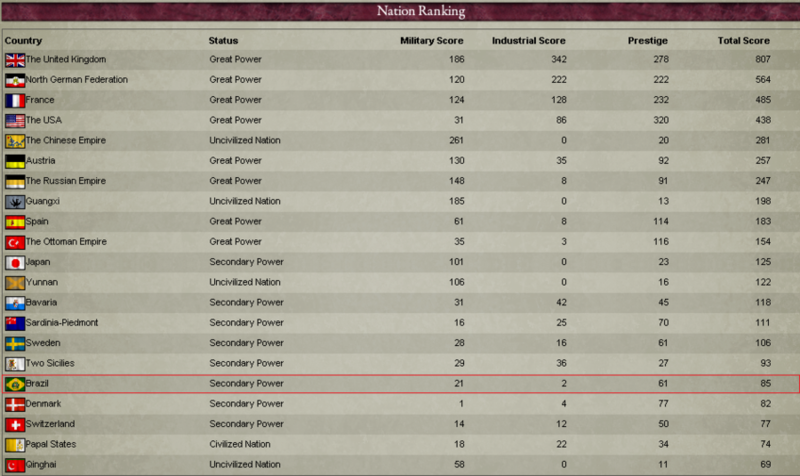 You may notice that the Chinese Empire is technically within the top 5, though it's not considered a great power since it is still 'uncivilized'. Guangxi, a Chinese substate, is actually within the top 8 as well. 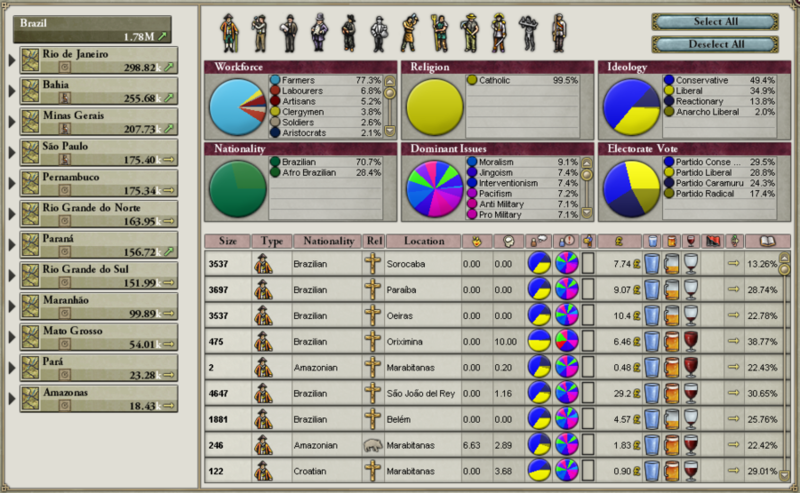 This may go to show how strong a unified, modernized China could be in Victoria 2. Our borders and our neighbors. With the exception of British and French Guyana on our north, we don't border any nations that I necessarily fear. I've kept the UK and France on good terms with me though, so they should leave us alone. I still think that we can get our core back from Colombia, but we'll have to keep a close eye on the actions and relations of Colombia and the USA in order to make sure we don't fumble that situation again. The USA has finished taking its western cores from Mexico. The USA literally has a 'manifest destiny' decision that gives it a cores on the entire modern continental United States. They didn't hesitate in taking those. 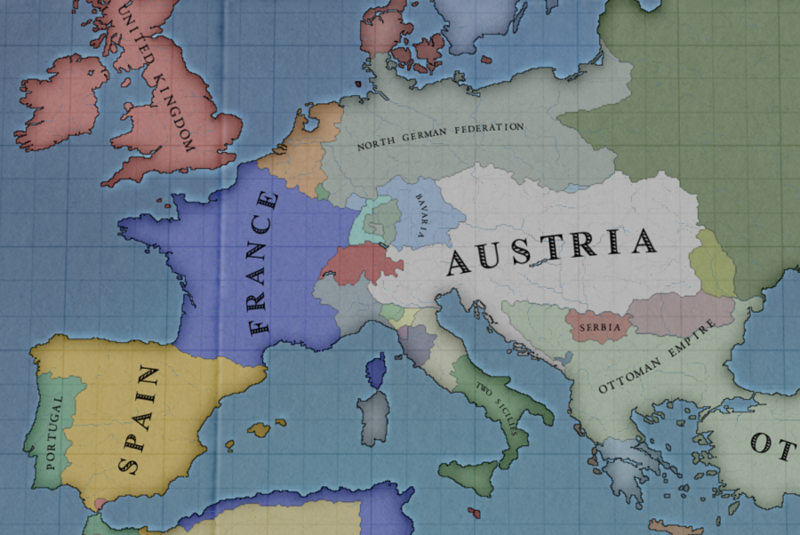 Prussia has not only reclaimed its lost state from Russia, but has also formed the North German Confederation, absorbing several minor North German states into itself. 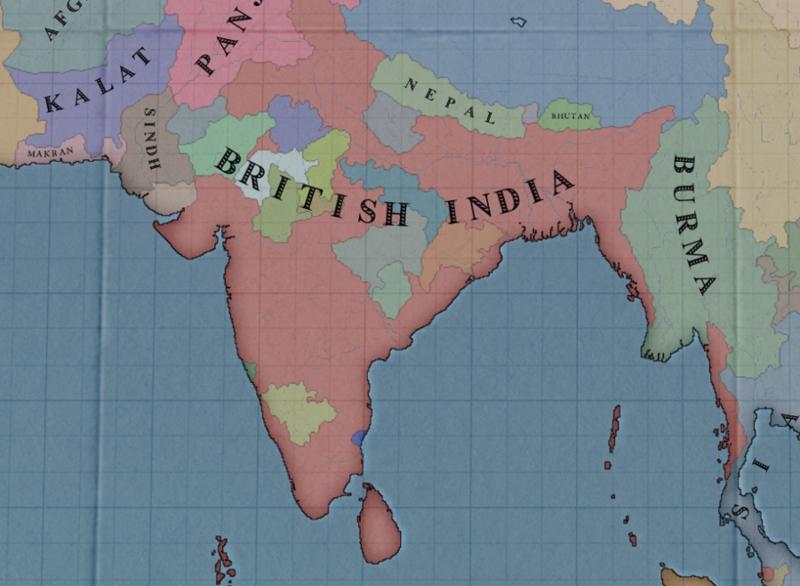 The UK's presence in India is completely dominant. There are millions of farmers and laborers here working RGOs, and those raw goods all flow back to the British Isles. This is giving their home states unprecedented access to rare raw materials such as natural dyes, a massive amount of basic goods, and luxury goods. 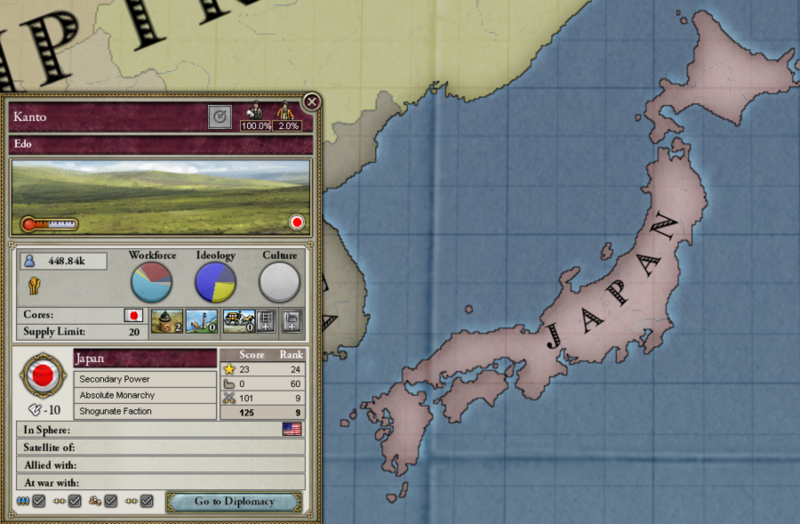 Japan has just finished modernizing. 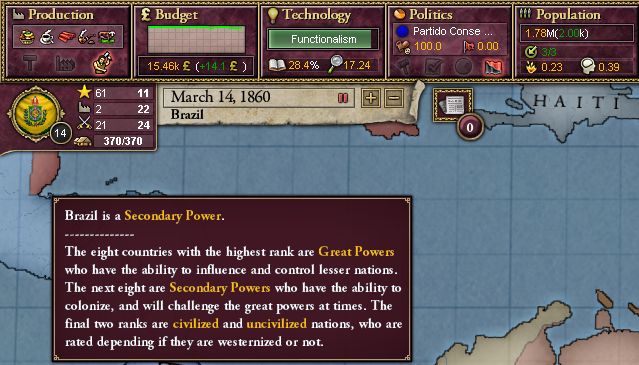 Coming out of uncivilized status and becoming a civilized nation has immediately catapulted them into the rank 9 secondary power. They should become a great power pretty much as soon as they lay down their first factory and improve their industrial score. And they'll do that relatively soon. So, now I have to ask: what would you like to see in this Brazil game? Keep in mind that I have to work within my means, so going head to head with the UK and taking British Guyana or something like that isn't within the realm of possibility for me, at least right now. Are we looking to dominate South America territorially? Should we continue down the path that I've been going - mostly peaceful and innovative? I'm curious about what people might like to see.